DutzWorks - Illustration and Graphic Design by Derrick Utz: Captain's Blog #10 - Update of "8 in Spaaace! Anthology and my extra contributions! Captain's Blog #10 - Update of "8 in Spaaace! Anthology and my extra contributions! WOW! It has been insane here on the boat as of late!! I have been mostly anchored down with major work projects due to a large trade show that we had a ton of work for and I just returned from there a few days ago. 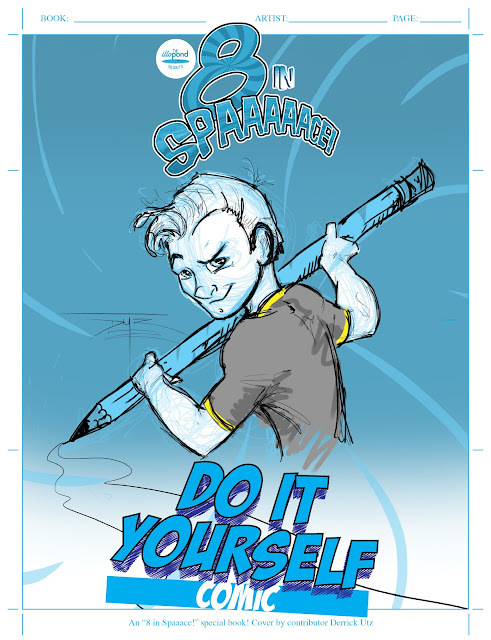 On the Captain's personal project side, the first Space-themed anthology out of Illopond.com's community of artists is now off to the printer's!!! It was a blast to work with the other amazing artists in this series and I look forward to many new projects with them in the future! For now, we are working on setting up promotional material and collateral so we can hit the ground running as soon as the first prints are available! Just for fun, I wanted to post some of the additional art I helped with during the creation process of this anthology. I am very appreciative to Paul Cageggi of processdiary.com, the project lead, for letting me participate so heavily! 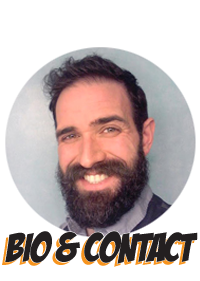 You rock Paul and were a "blast" to work with!!!! 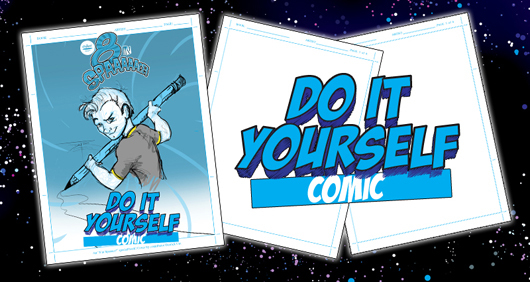 First is the cover to the special "Do It Yourself Comic" section. We have a lot of neat hopes and ideas that kids will take this section of the book and really enjoy creating their own awesome tale of Spaaace or any other fun comic they want! I had a lot of fun creating the cover art for this and stylized it after a true comic illustrator's page. I also was thinking a great deal of my 6 year old son so the character resembles him heavily! He was quite excited about that! I was also able to help with an additional special section called the "Contributor's Concept Gallery." This was to showcase some of the sketch and doodle work that each of the contributor's created while designing and laying out their tales. This was a great opportunity to use the other artist's work and my graphic design skill set to create a section that was truly unique. I intended for this to look like a very aged and weathered sketchbook floating through space and then I imposed the different artist's works onto the pages. 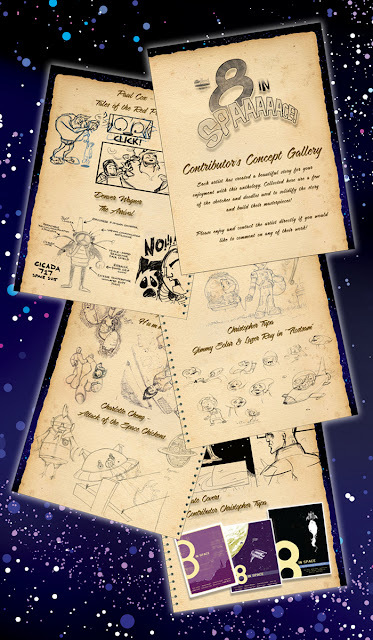 Below is a quick look of the Gallery section that you will see in the final product! Click on it 'cuz the Captain gave you a big picture here! Alrighty me Mateys, I think I will stop this post here and I will have more complete information in the next post about the purchase price and locations we are looking to use to distribute the anthology for all of you waiting so patiently! Thank you all so very much for following along with the Captain for this first anthology/publishing adventure and I will keep you all in the loop with progress on the new Spaaace anthology book #2! I will be posting the books progress here and Kodi's story entry progress on his new blog, kodithestarfish.blogspot.com. The first layouts of the 8 pages are already posted there so go take a look!